Santa Barbara is home to the largest Fern Pine in California. 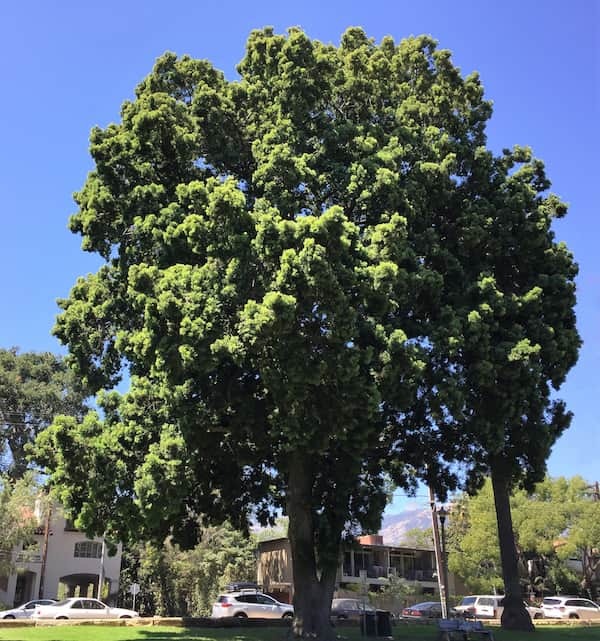 Recently nominated for this recognition by Tim Downey, Santa Barbara’s City Urban Forest Superintendent, the “Champion Tree” is located in West Alameda Park near Micheltorena Street. Planted in 1910 by Dr. A.B. Doremus, our first Park Superintendent, the Champion Tree is 86’10” tall, has a 50” trunk diameter, and bears an average branch spread of 61.5”! Wow! It is dioecious, meaning it has two genders. Male trees have small pollen-producing spikes and female trees have “cones” bearing 1” diameter oval fruits with greenish-yellow flesh over stony seeds. Male trees are preferred because the fallen fruits can be quite messy. From a distance, both genders have stunning billows of soft, graceful, weeping boughs. The leaves are leathery, narrow (1/4” to 3/8” wide, 2” to 4” long), light-green when new, and dark grey-green at maturity. The bark is mottled gray-brown and slightly furrowed. The Fern Pine is one of the most attractive and versatile of plants available in our landscapes. As a young plant, it has both branches and foliage from the ground up. With selective pruning, it can be grown as either a tree or a hedge. Trained to be an excellent shade tree, it will be slow-growing up to 30’ to 50’ in height, with a 20’ to 40’ spread and a round- to pyramidal-shaped crown. Since it readily sprouts twigs from its trunk and branches, it can be trained to be a thick screening hedge or espaliered as a lush cover on a wall or trellis. The Fern Pine’s common name is quite misleading, as it is neither a fern nor a pine! 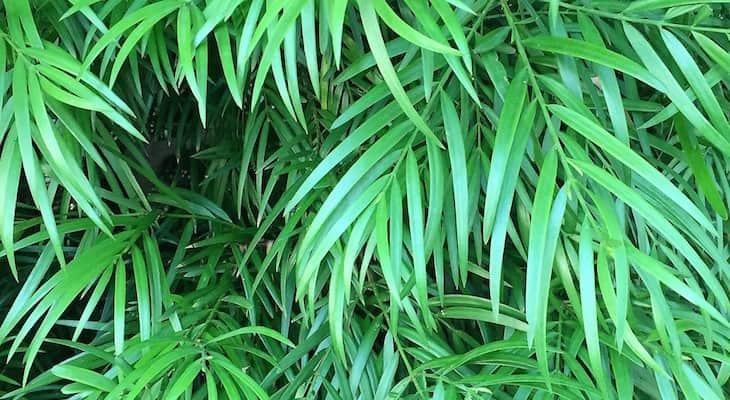 Its former genus name (still commonly used) was Podocarpus – from the Greek meaning “footed seed”. The genus name was recently changed to Afrocarpus – meaning “African seed” – referring to its native habitat of Ethiopia, Uganda, and Kenya. Thus, the current scientific name is Afrocarpus gracilior or Afrocarpus falcatus. This tree is much tougher and more drought tolerant than its soft appearance would indicate. It grows well in restricted urban planters and with our natural rainfall; however, it does do better with monthly deep watering in the dry season. It tolerates all types of soil, but prefers good drainage. Fern Pines can be seen as street trees on the east side of the 2300 block of Bath Street (planted in 1959), as well as on Hitchcock Way, the 3000 block of De la Vina Street, the 200 to 500 blocks of East Ortega Street, and the 900 to 1100 blocks of Milpas Street.